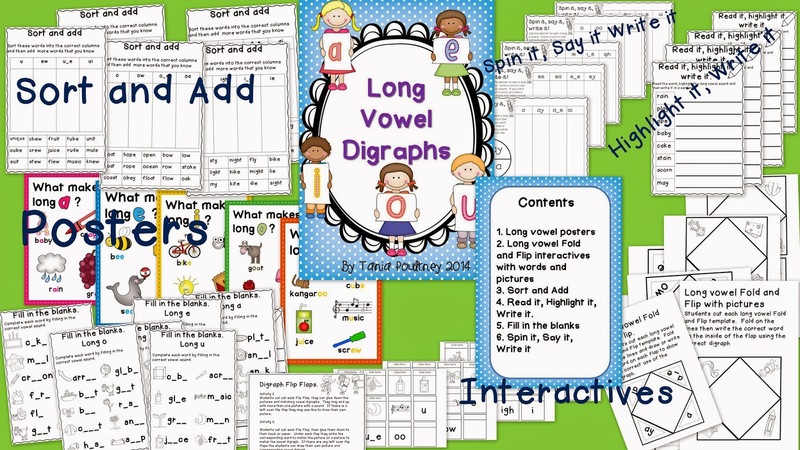 This term in my classroom we are continuing to look at long vowel digraphs. So I made this pack for my kiddos to have some fun with it. I am going to run through what we do and how I am going to incorporate this new pack into our routine. In their books the students will have a master list, they can add to this when they find any new words with that digraph. 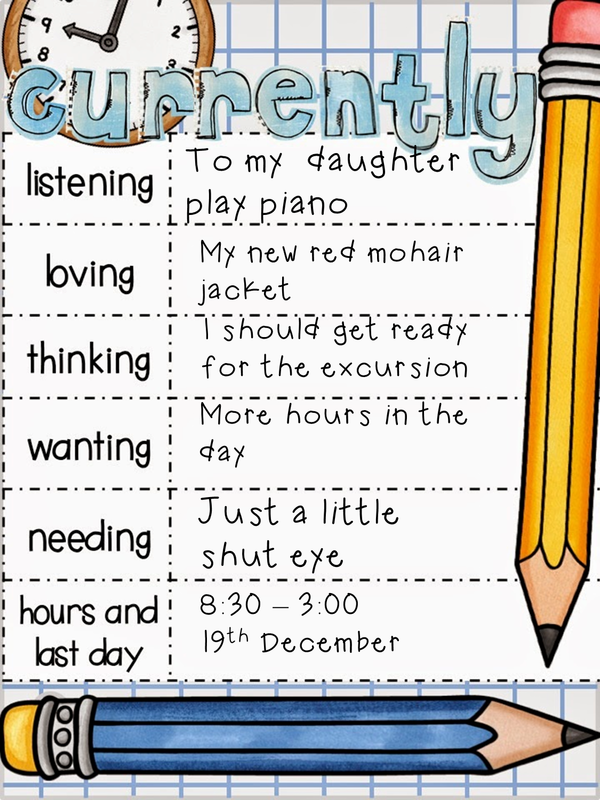 We use this list to do other activities like silly stories or making word tangles.....BUT now that I have finished my latest file we will be doing so much more. In this pack I have posters that will look so much nicer on our walls than the handwritten ones I have done and the rest of the pack is really a print and go pack. 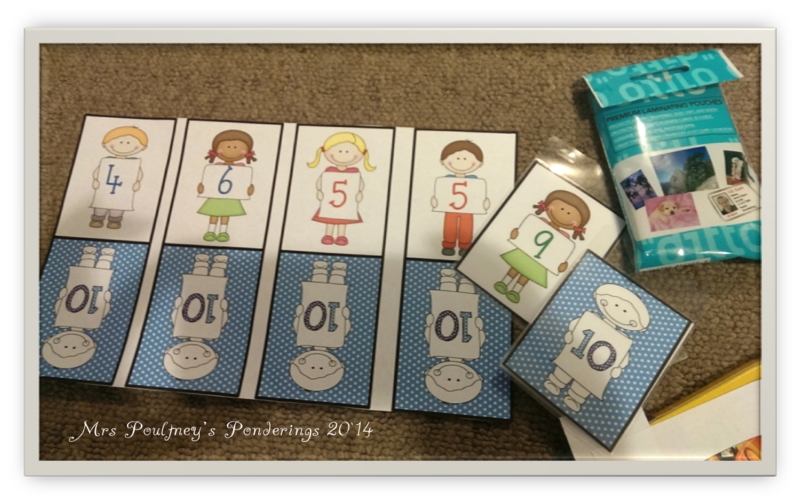 Sort and Add: Kiddos have to read the words, sort them into the correct columns and add any new words they may know. Highlight it, Write it: Kiddos have to say the words, highlight the digraph and then write a sentence for each word. 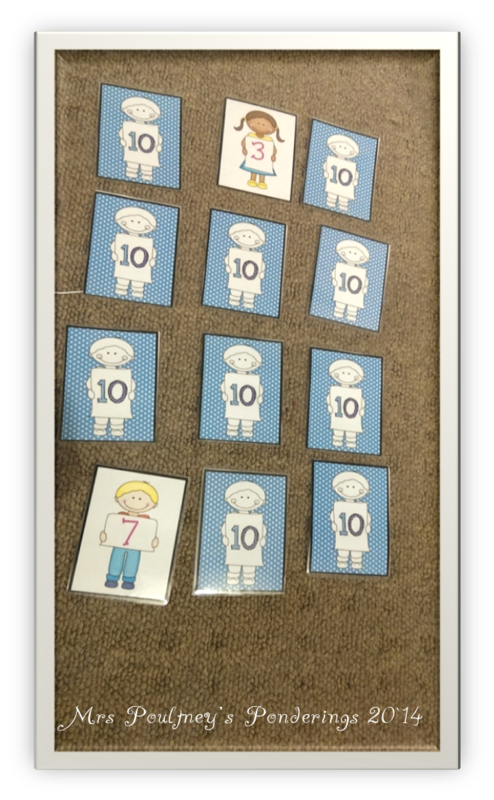 I have also included a range of interactive activities. 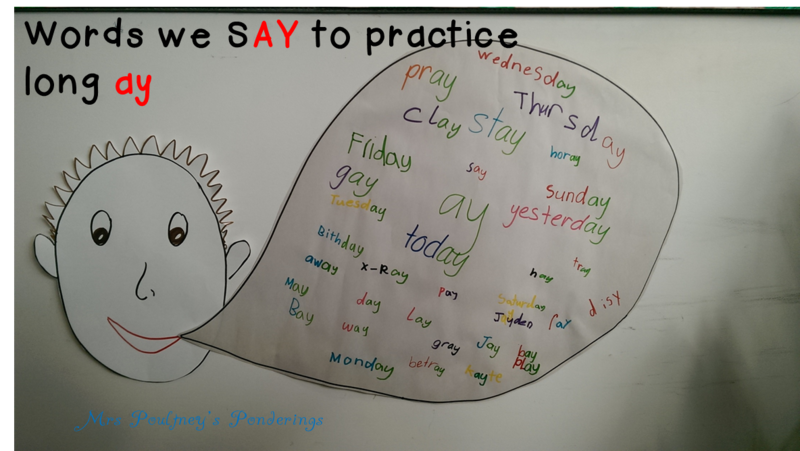 Spin it, say it, Write it: This is an activity students can play individually or with a partner or even in groups of 4. 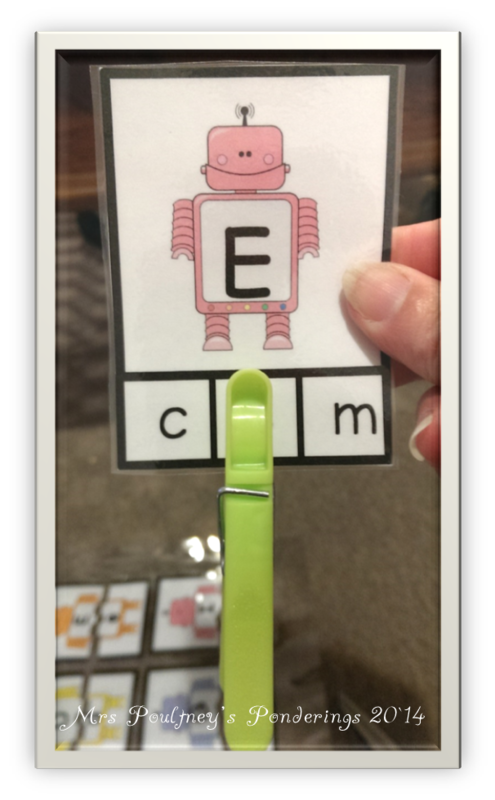 On each page is a spinner that students can use a paper clip and pencil to spin a digraph. Students have to say the long vowel sound and then write a word in the appropriate column, if they can't think of a word they miss a turn and their friend has a go. The winner is the kiddo who has the most words at the end. Here is a pic so you get an idea. I just know this is going to be a big hit! 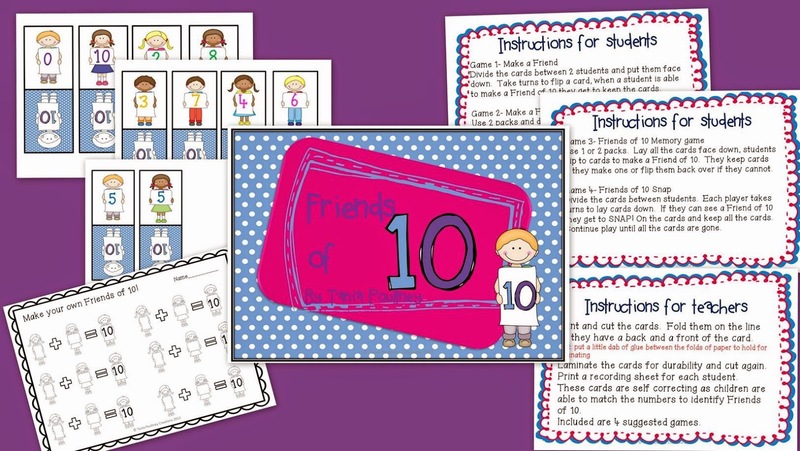 Fold and Flip: These templates have either a picture or the digraph on one flap. Kiddos can either write a word or sentence to go with the picture or digraph, I know my kiddos love to make Flip Flaps so I can see this one will keep them thinking. 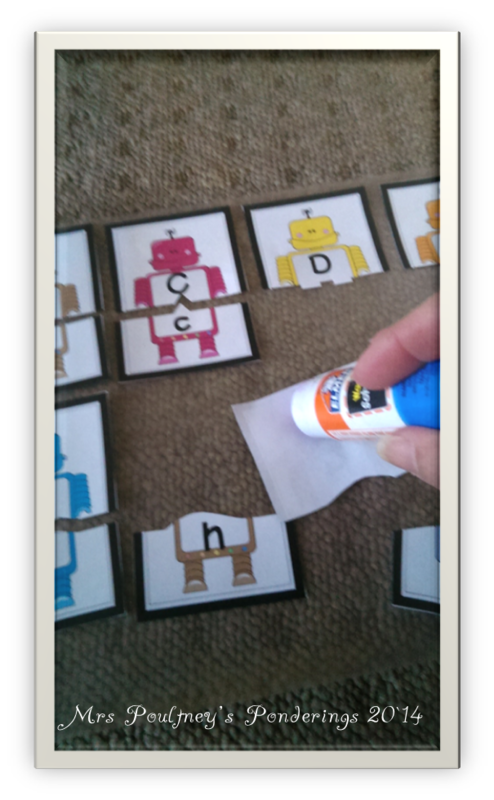 Flip Flaps: These are similar to Flip Flaps I have in another product, kiddos cut out all the flaps and then match pictures to correct digraphs so they end up with little flip books glued on to their page. Some of them might have only one picture to go with the digraph so I also included blank flip flaps for them to add one of their own. Well I am excited to get back to school to use this with my kiddos but YOU can get started right now, this is 50% off for today (what a bargaaaiiiinnn!!) so click on the pic above to get your copy. I feel as if I have neglected this little blog of late but I have been busy enjoying the holidays and catching up on some reading. So I thought I would pop in with a bit of a catch up post, here is what I have been up to. This is my very proud children with their Dad at the Anzac Day ceremony and march. We were in a little town outside of Hobart, my husband's unit travels to some of the smaller towns that may not have military members. It was a beautiful day weather wise and the ceremony was conducted wonderfully. This was also the first time my Mother in law got to see her son march as we don't usually live near enough to family for them to attend, so it was a very special day for our family. What else have I been doing? Reading, reading, reading. I save up all my reading for the holidays that way I won't get interrupted with life and school getting in the way of a good book. 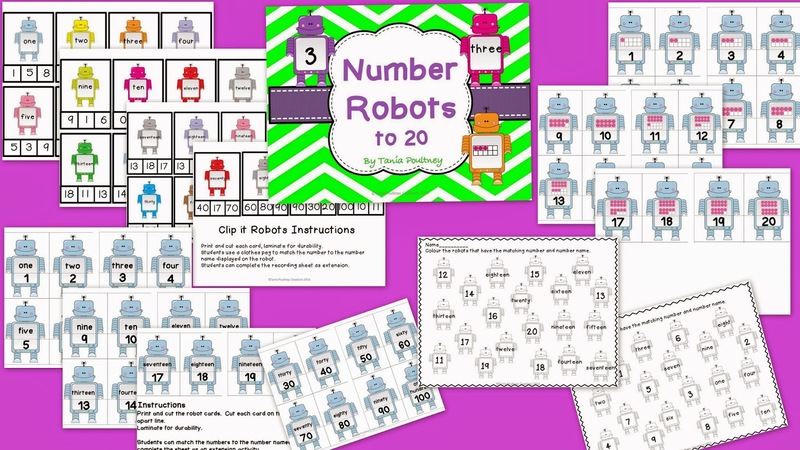 I have also carved out some time for working on TpT and have gotten a companion pack to my Alphabet Robots up and running, it is matching numbers to number names to 20 and is called Number Robots to 20. (such a creative title!) I have also bundled them so you can get both at a discounted price. BUT!..... 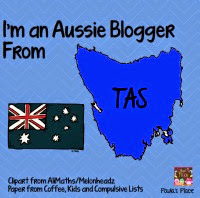 I wanted to pop in to remind all my Aussie readers about a couple of previous posts that I have done about ANZAC Day, which will be tomorrow for us. As many of you may know my husband is in the military BUT....my father and father in law were also in the RAAF, both my Grandfathers served in WW2 as well as my Grandmother, so you could say tomorrow is a BIG DEAL in our house. We will be attending the dawn service and then the march, then out to lunch with some friends (also in the military). Anywho, you can read about my post where I visited a War Cemetery in France and found my Great Grandfather's war grave here as well as some poppy art I did with my kids here. So while you are enjoying reading those posts I will be putting my feet up enjoying my holidays and reading a book! I had such a productive Sunday! I made our dinners for the week, beef casserole, potato pie, chicken tikka masala, home made pizza and chicken schnitzel, with a sweet treat pear and blackberry tarte tan, yum! Even though it is a short week and I am on the count down to the Easter break I am also really tired and very ready for the holidays, so having a weeks worth of dinners ready to go will make the home stretch to holidays a little easier. 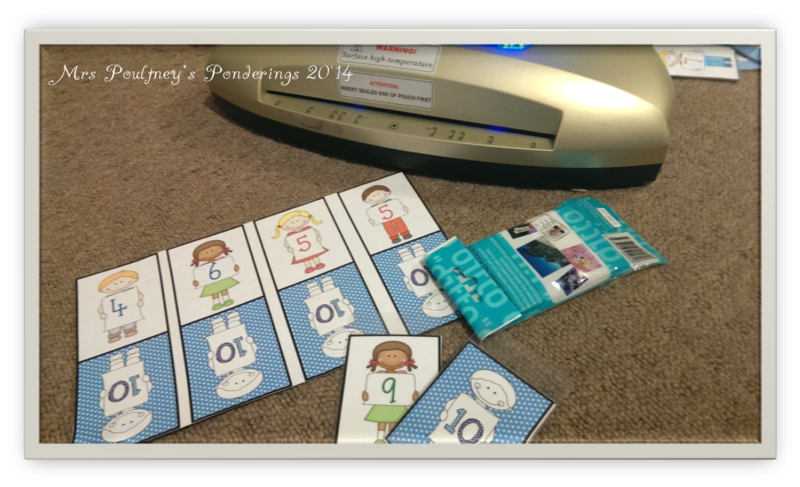 Here's a little tip for you when laminating lots of little pieces. Put a little dab of gluestick on the back of the pieces that you don't want to slip around in the laminate as it goes through the laminator. See in the second photo none of the pieces are slipping out as I lift the laminate. The glue dries clear so you don't see it. This is the clip it Robots. 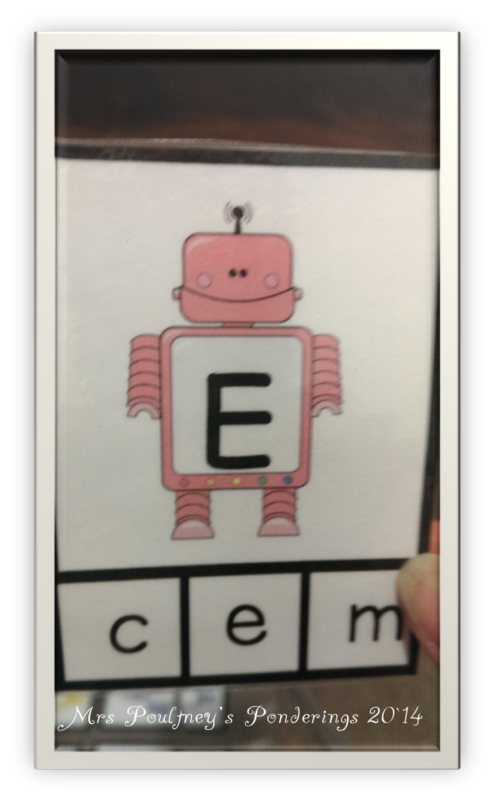 Students clip the lowercase letter that matches the uppercase letter on the robot. You would easily see if the letter doesn't match. 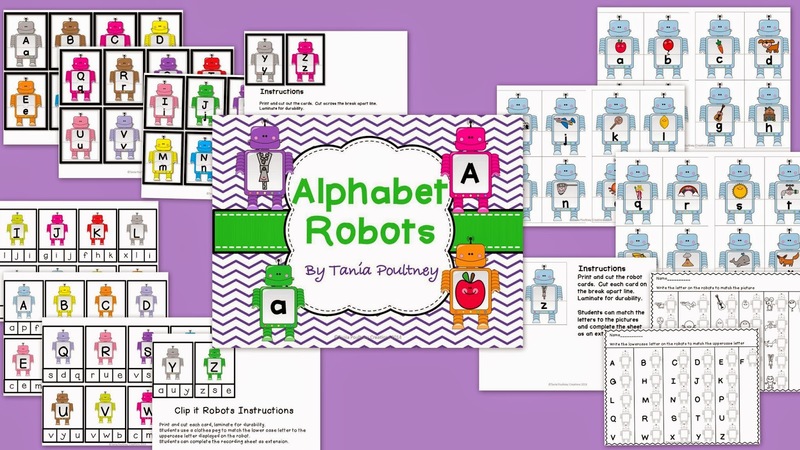 This file also has a Robot lowercase and uppercase puzzle cards as seen in the pic above and picture and initial sounds puzzle cards. I have also included 2 recording sheets. 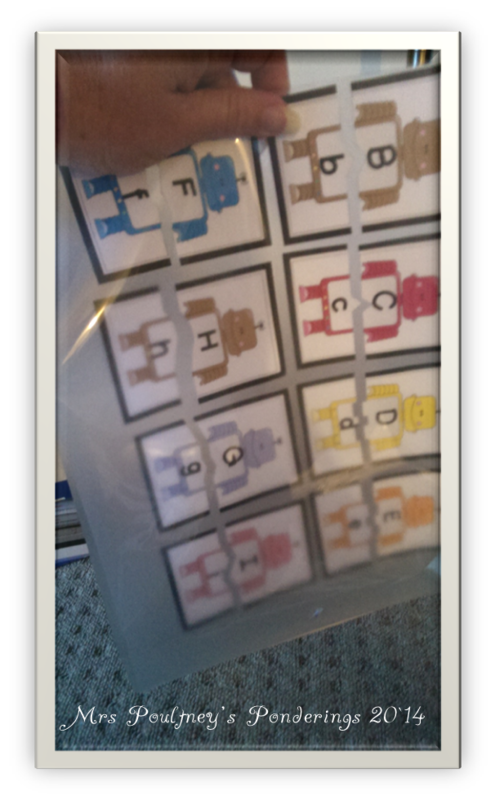 These cards are double sided, so once cut fold them before you laminate them. I made these cards so that they would fit into business card sized laminate pouches so minimal cutting. This is my friends of 10 game. I love this because it is self correcting with the numbers that add to ten being the same color. My boys will be busy! You can get both of these in my store by clicking on the pics or enter the Rafflecopter to win a copy of your own! 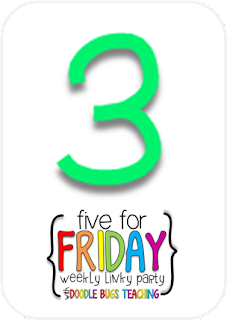 I am so excited again to be part of this amazing group of bloggers sharing some of their best ideas to help you in the classroom. 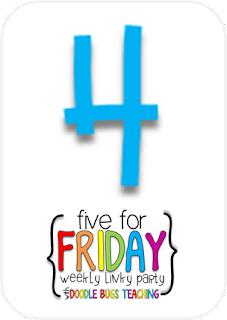 This month I wanted to tell you about a great website I have used in my classroom over the last couple of years. It is called the Literacy Shed (it is UK based) and houses a store of great animations for the entire range of grade levels. 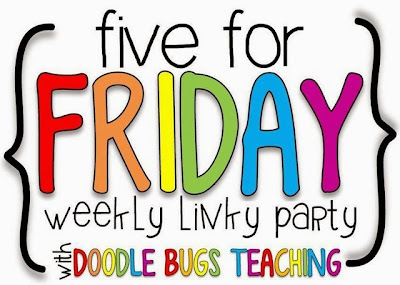 I have used this website when I was a substitute teacher as well as in my every day teaching. The videos and animations are organised by themes and genres, after you have read through my description, click on the pic to head over to start browsing through the many videos. This post does come with a warning though.......once you start browsing through the animations, you will not come out for hours......if I were you, I would use the bathroom now, then sit down with a coffee and a snack. Comfy? Good, you are in for a treat! Right now I have been using this site to help my kids with inferring, many of the animations have no dialogue so students have to really think deep to find out what the authors message is or to predict what might come next. We also looked at the lighting and colors used in the animations and how this influences our decisions, predictions and inferences. Here is something I recently discovered.....there is also a MATHEMATICS SHED!!! 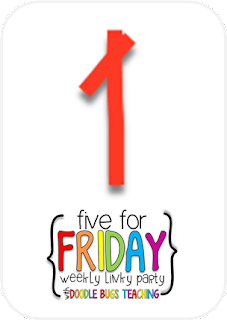 Of course there is nothing more left for you to do but to head over there and check out all the amazing videos you now have access to that will support your Literacy program and your Mathematics program in your classroom. Oh I may have forgotten to tell you this very important thing......there is no sign up, no trial, no subscribing and getting annoying emails, in fact there is NO COST involved at all, yes this is a FREE website. I will leave you with one tip, do make sure you check the video before you show your kiddos, yes they are aimed at children but you do want to make sure the video you use is aimed at the age or grade level you have. 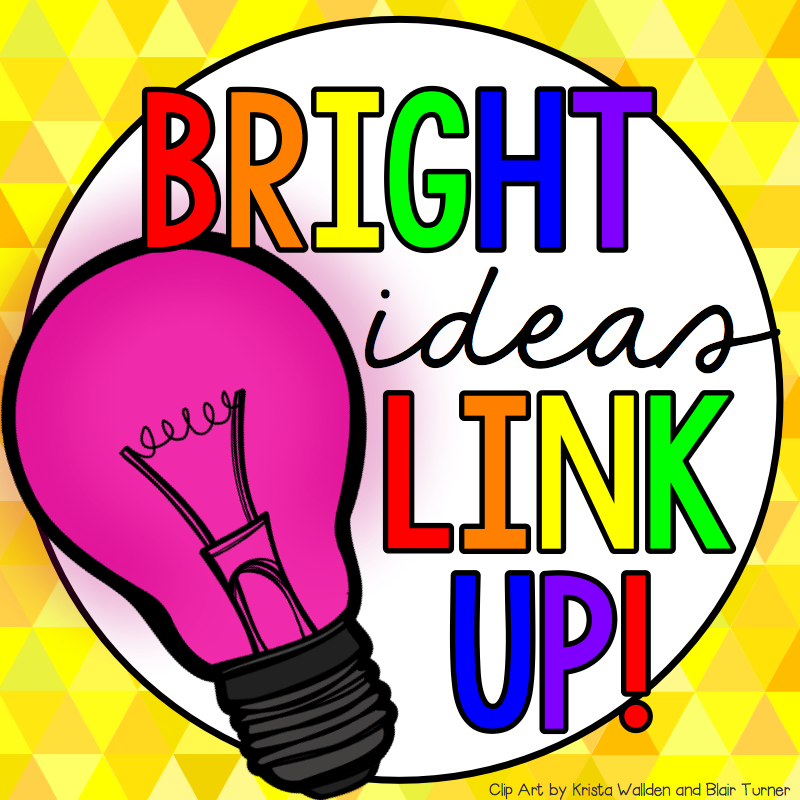 Now for more Bright Ideas for your classroom head over to the linky! 1. 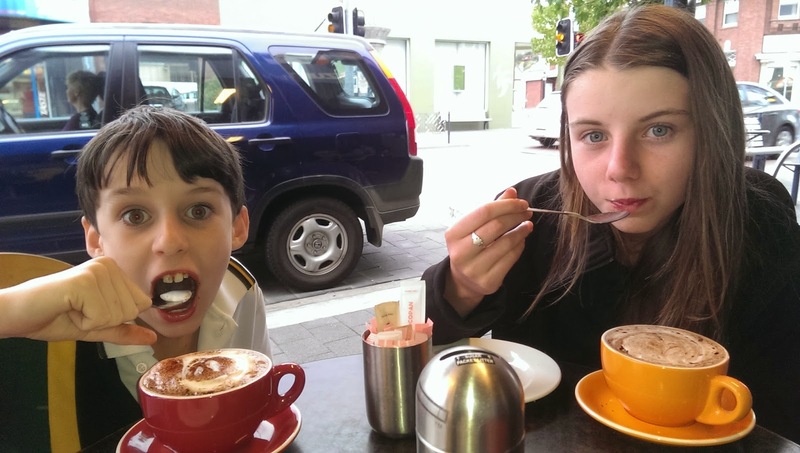 The cooler weather is starting to creep up on us here, so we stopped at a lovely cafe on our way to piano lessons to enjoy some hot chocolate. Can you tell who is the comedian in our family? Apparently he takes after me, heehee. 2. 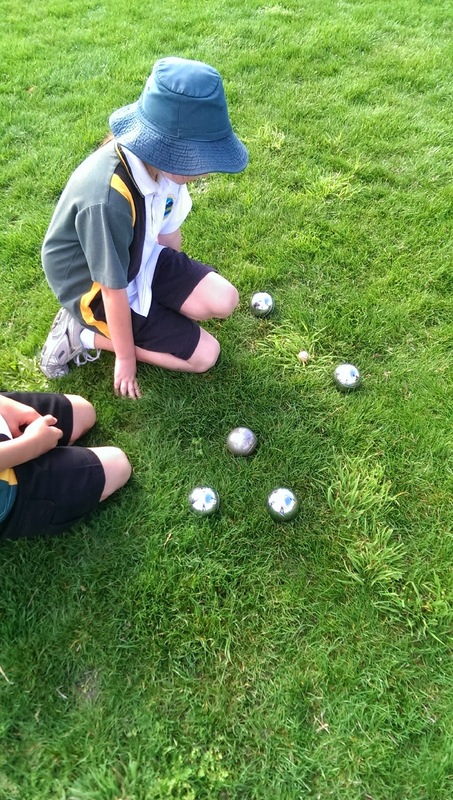 In French lessons this week, the teacher took all the classes out to play le boule (I have no idea if I that is how you spell it correctly) Lucky me I got to join in as I was with one of my support kiddos for this lesson. It was lots of fun, and my team won, yay! 3. 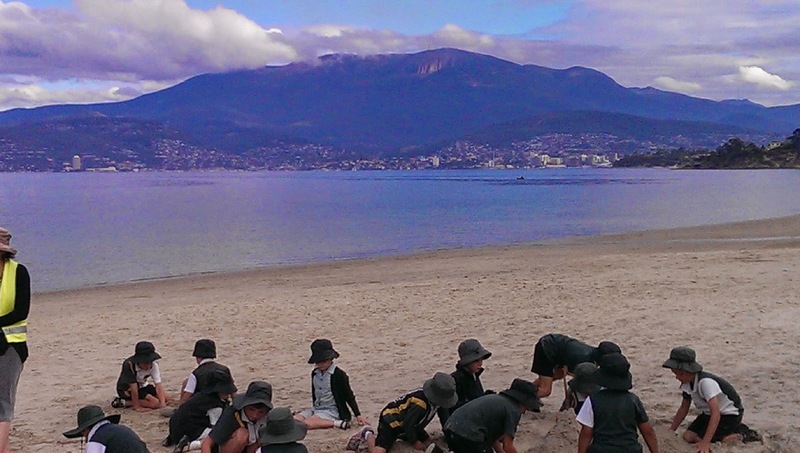 As some of you may know our school is pretty much on the beach and I have been itching to get my class down there to do something!! There are a number of things going on in our classroom and one of them is looking at water as a natural resource. 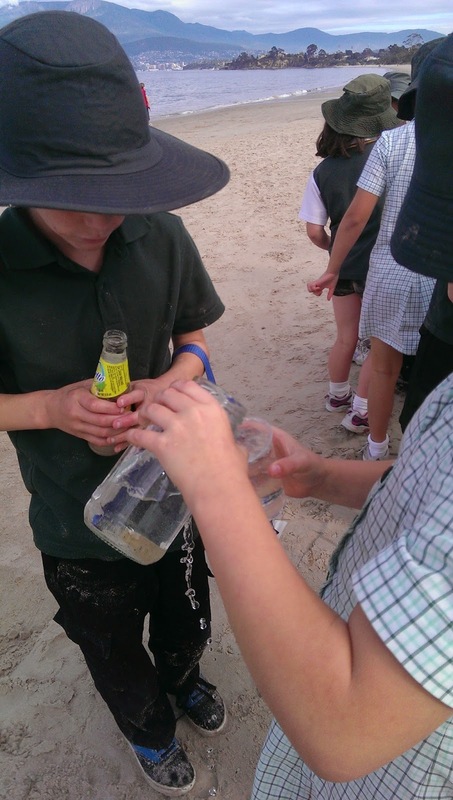 So we headed down to the beach to look at how we can transport water. Our kiddos had a jar each that they had brought in from home and we got them to fill their jars right to the top and then see how far they could walk before spilling any. I have to let you know that we had to do this twice as some of the kiddos said they walked 114 paces, but these were so slow a snail could have gone faster. This is the view from our beach. 4. 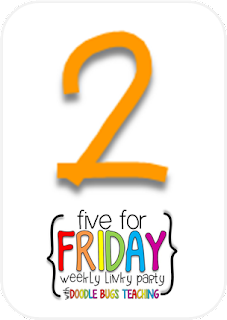 We still have next week at school, so 3 days with the kiddos, 1 day as Pupil Free Day and then Good Friday. 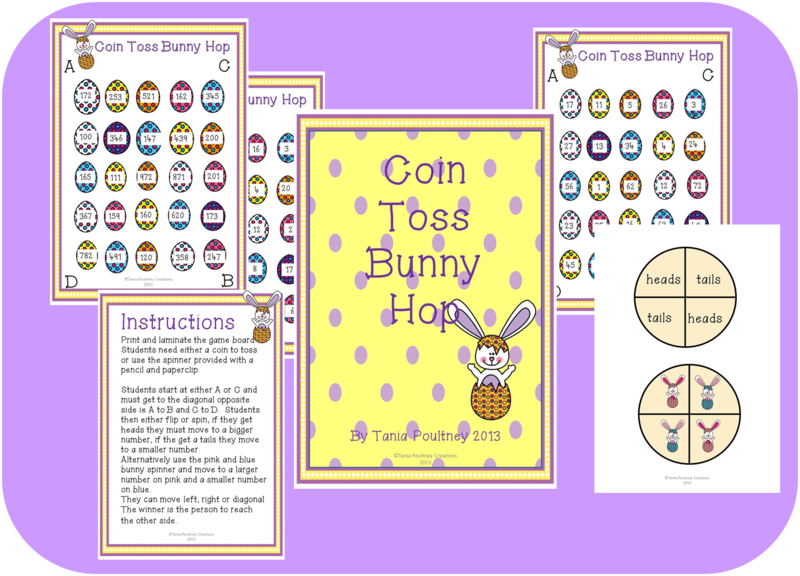 We have been playing my Coin Toss Bunny Hop game that is free in my TpT store, but I forgot to take a pic! 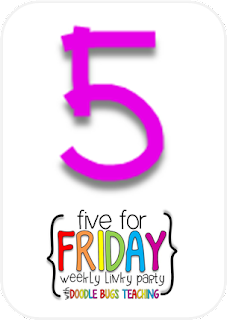 Then this morning I found my sweet friend Mel has it on her Five For Friday as well. So you can grab your copy by clicking on the pic. This game is differentiated so you can have kiddos playing the same game but at different levels. 5. This week has also been filled with meetings and lots of computer time making sure I have got referrals in and all the paperwork needed for the end of term. So this week has included some chill out time and that means reading (re-reading) my favourite series, Outlander by Diana Gabaldon, I have been reading this series over the last 15 years, some of the books I have read 4 or 5 times. Why because there will be a new book released in June, so I have gone back to the beginning of the series, I am on book 4. I am looking forward to the holidays so I can power through a couple more of the books. The best news is, in July the series will be released as a mini series, I so hope we get it in Australia, I don't think I can wait for the DVD's to come out to see some of my favourite characters come to life. Well, that is my week in a nutshell, but thank goodness the weekend is here! Head over to link up as well. 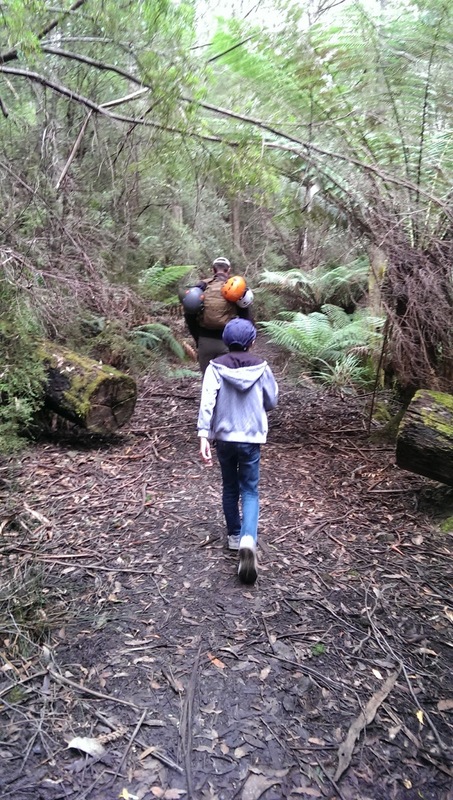 We started the week with a bush walk and an adventure into a cave. I love the look on my son's face, we had turned all our headlamps off and when the flash went off it startled my son, hehe. We saw lots of stalactites and stalacmites, a creek that runs through the cave, cave crickets and glow worms, it was a pretty awesome day. 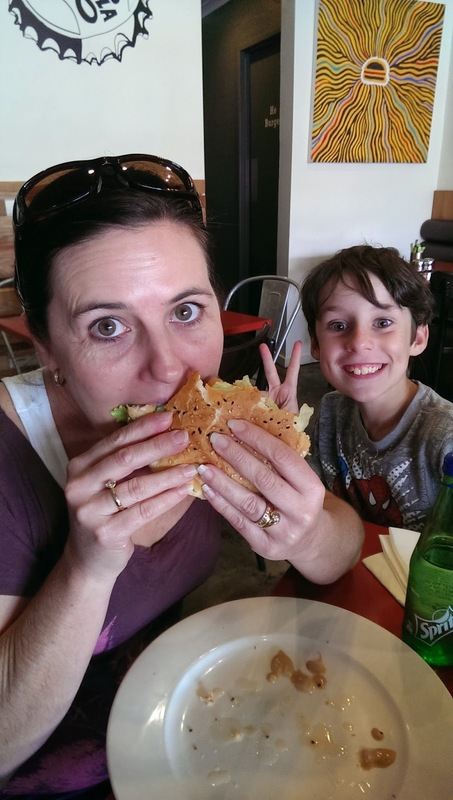 We enjoyed yummy burgers at Burger Got Soul, and there he is again my little photo bomber. 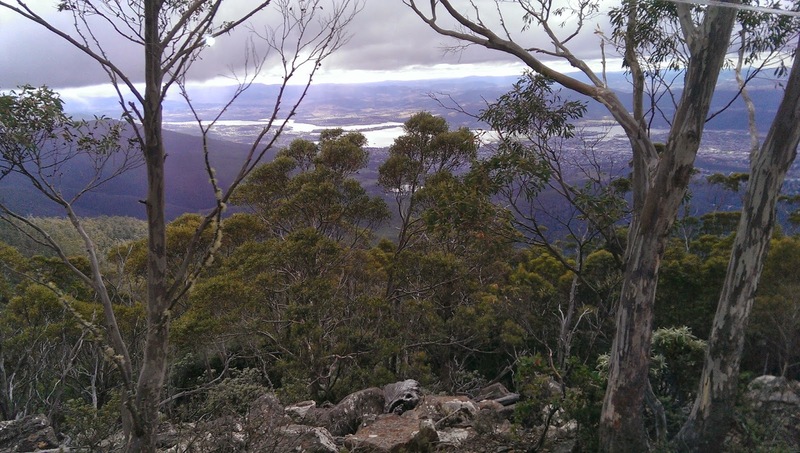 We went on an excursion (field trip) to the Tasmanian Symphony Orchestra (sorry couldn't take photos there) and up to the top of Mt Wellington which is a significant landmark in our city. Unfortunately the weather came in and we couldn't see anything from the summit, so we had to catch some views on the way down. I took these pics on the bus. 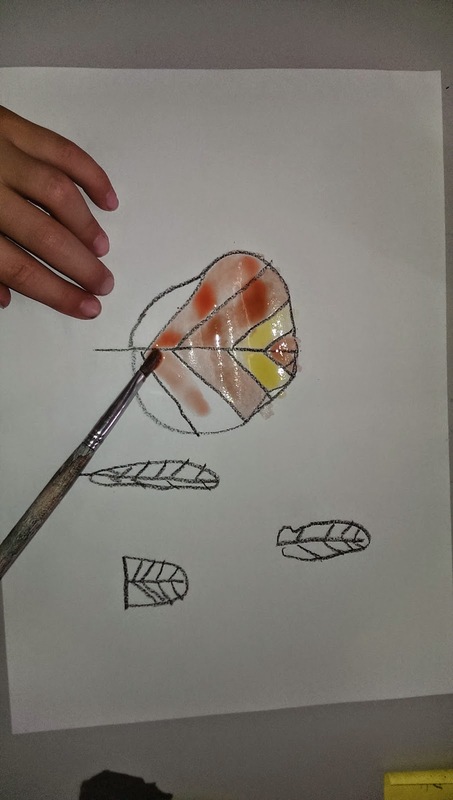 It is Autumn in Australia so I started some Autumn art with my kiddos, looking at warm and cool colours using water paints. 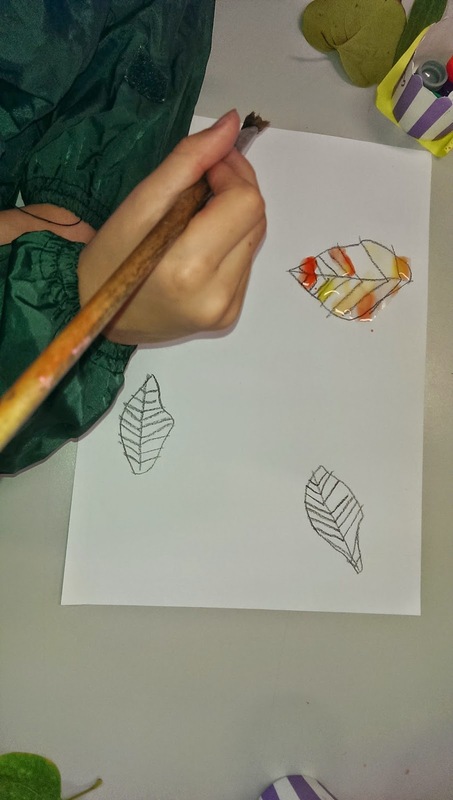 We will revisit the Autumn art later as well as the leaves haven't really started turning yet. 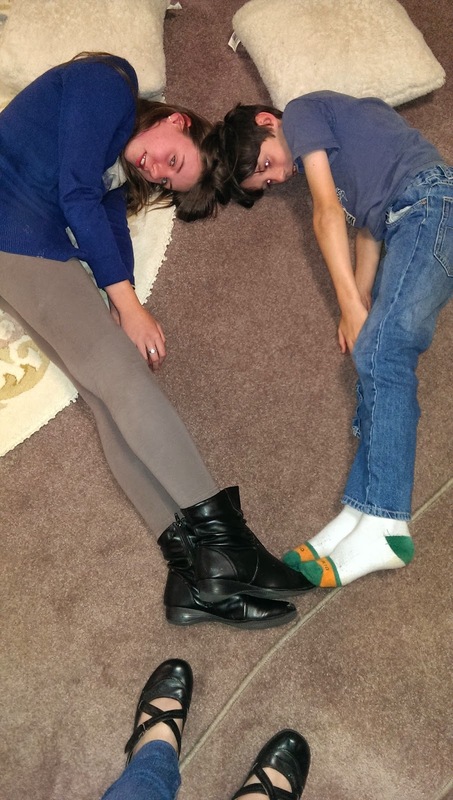 I just had to share this with you, they were trying to make a heart shape, too cute! This was at my in-laws house for Chinese takeaway dinner, it was delicious! Hope your week was great! I am linking up with Farley for this months Currently. I aim to try to get this done and link up early but it never seems to happen, oh well it is done now. My daughter is a beautiful piano player and we usually start our afternoons with her practicing. It is actually a very relaxing way to start the day as well. We all hope she goes quite far in her life with music, you can tell by her playing that she is passionate and it is a huge part of her life. Sadly that talent does not come from me, although I am pretty good on the tambourine. Earlier this year I bought this gorgeous red mohair long jacket and the weather was cooling down enough (for me) to wear it, but we recently had a spike of warmer weather, which I love but I don't get to wear my red jacket. People, this is a real conundrum for me. 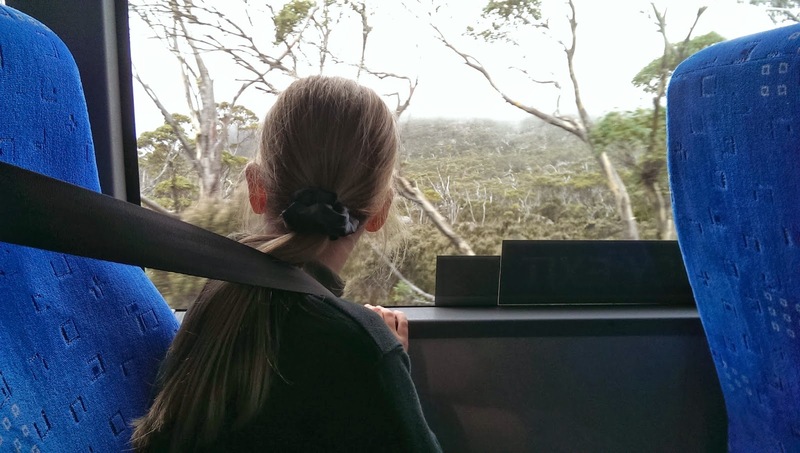 Tomorrow we have an excursion to the Tasmanian Symphony Orchestra, then a drive up to the top of Mt Wellington and lunch at a park before heading back to school. I am not a teacher that loves excursions, I always feel like I am not quite organised or I have missed some paperwork or I am herding cats. I just can't get into it, so I go into tomorrow with reluctance but I am looking forward to hearing the orchestra. With my new role and having a classroom role 2 days a week I feel like my days are so busy and full that there just don't seem to be enough hours in the day, my list of things to do are just getting longer and longer. Well of course this just rolls on from my last comment. Sleep is elusive at the moment for a number of reasons, some nights I cannot get my brain to turn off, ever have that? The other reason is that our cat has decided that the middle of the night is a great time to play and chat, friends I love that cat but I love sleep more, this could end up quite badly for one of us........hint.......it won't be me. At the end of our school year in Australia the kiddos finish the day before the teachers and we finish on the 19th Dec. I actually would prefer to finish a week earlier and go back to school a week earlier, I hate finishing so close to Christmas. We don't go back to school until the beginning of Feb here, it feels really late. Righto, your turn to head over and link up!